Many people like the idea of preserving fruit and vegetables but find the whole process a bit of a faff and quite tricky to master. 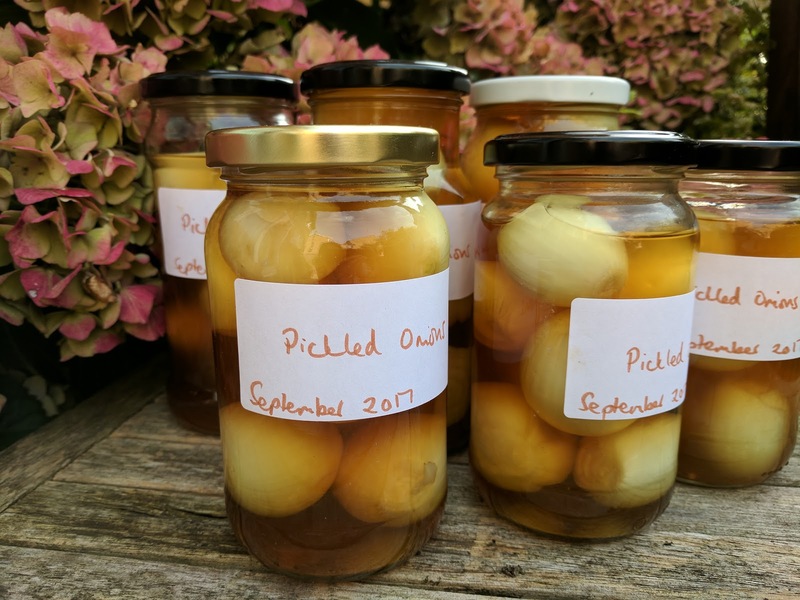 If you fancy having your own row of perfectly preserved vegetables in a jar then look no further than onions. The small pickling onions are in season at the moment. As they need to mature for at least 2-3 months before eating they will be ready just in time for Christmas. You can serve them with a cheese board, cold cuts of meat or of course as part of a classic Ploughman's lunch. For that personal touch you could give a jar as a homemade gift. One thing to remember with pickling onions is that everything needs to be kept cold. Any warmth could start to cook and soften the onions when what you want is a good crunch! Once made keep them in a cold, dark place until you are ready to open a jar. As the combination of vinegar and onions is strong store them away from any delicate flavours such as jams and jellies. Equipment: Large bowl, clingfilm/tea towel, glass jars and lids, funnel (optional). Top, tail and peel the onions. Cover in water. For every 1 pint (568ml) used to cover add 2oz (55g) salt. Cover with clingfilm or a tea towel to ensure nothing drops into the bowl and leave in a cold place for 24 hours. Once the onions have soaked overnight ensure your jars and lids are fully clean and sterilised but not warm or hot. Drain the onions and put into the jars. Fill the jars (using a funnel if you wish) to the top with the vinegar. Seal with the lids, label and store in a cold, dark place for at least 2-3 months before opening.